I don't have to tell you how much I like writing about juniors that are working in Nevada. All you need to do is head over to my blog on the Mining Stock Talk page, scroll down the list of articles and you will see that I've done quite a few write ups on Nevada players. One of the reasons for following these Nevada juniors of course is that the state of Nevada is a very mining friendly place and both miners and investors alike today need all the help they can get. There is nothing worse than uncertainty in investments. The other reason is that Nevada is a gold rich state. In fact Nevada is the fourth largest gold producing region in the world, and produces 79% of all gold mined in the USA. Nevada has 30 large gold deposits that contain 1M+ oz in current resources & reserves. Barricks Goldstrike deposit in the Northern Carlin Trend is North Americas fifth largest producing gold mine. So if your looking for gold, look to Nevada. Anyone who has looked at Nevada from a prospecting point has heard of the different trends in that state. The most famous of all trends is the world famous Carlin Trend and the Battle Mountain & Cortez Trend. Nexus Gold property is the Walk Ridge property which is situated in the Independance & Jerritt Canyon Trend. This trend is just slightly north east of the Carlin Trend where the Barrick along with other majors have producing mines as seen in the map image below. The Walker Ridge property is right between the Jerritt Canyon Mine and the Big Springs Deposits. The Jerritt Canyon mine is a 11 million ounce past and present producing mine and the Big Spring deposit is a 1.2 million ounce deposit the Nexus Gold is surrounded with excellent prospects. In October and November of 2014 Nexus Gold employed a leading-edge, innovative Element Detection Technology (EDT) at Walker Ridge. This technique has been successfully used by a small group of petroleum clients over the last five years. 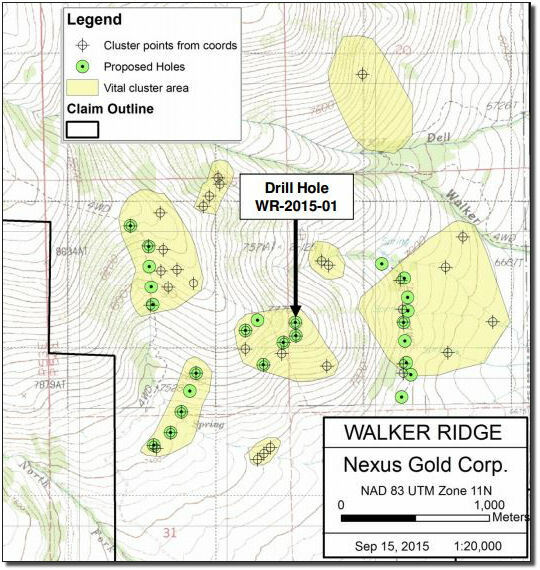 The fall survey at Walker Ridge identified gold atomization in 34 points of interest within eight clusters over approximately a two-square-mile area within the Nexus claim block. In late 2015 the Company began to drill test Walker Ridge with initial results on the first hole confirming both gold and silver mineralization in the lower plate host rocks. Drill hole WR-2015-01, the first hole drilled on the property, encountered a 355-foot section of the lower plate that intersected 205-feet of elevated silver (Ag) averaging 10 g/t (including 18 g/t over 20 feet) and 15ft of gold (Au) averaging 1.57 g/t (including 3.22 g/t over 5ft). The junior mining market the last few years has been quite soft and the market was especially cool the last little bit and the stock price of Nexus Gold suffered during the winter months. While in the midst of planning a second round at Walker Ridge the Company jumped at a chance to add quality projects to its portfolio. As a result management figured that waiting until precious metal prices improve would be best for financing and in the meantime took advantage of an opportunity to aquire an option on gold properties in Africa in the country of Burkino Faso. Nexus Gold Director, Warren Robb, P.Geo, was Chief Geologist for Roxgold in 2012, where he wrote the 43-101 on the property. Mr. Robb will plan and implement the Nexus Gold drill program at Bouboulou. 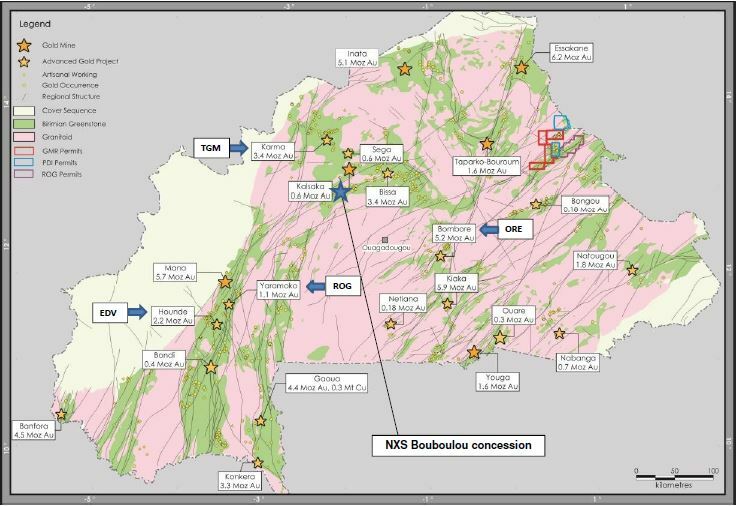 Nexus plans on a drilling program for 2016 with the goal to establish continuity of these zones and to extend them. The initial program will consist of 2000 meters of diamond drilling to a maximum depth of 200 meters. A very recent commentary article posted on Kitco had a very good summary of exploration in Burkino Faso since the government had changed. Lots of activity in the merger and buy out department with various gold producers in the country. The article points ot some well known names in mining such as Semafo, Roxgold, Endeavour Mining, Yamana and Orezone all doing buy outs of various smaller companies. With metals pointing higher and a country rich with gold along with a new government that wants to see mining developement, Nexus Gold has made an excellent decision. 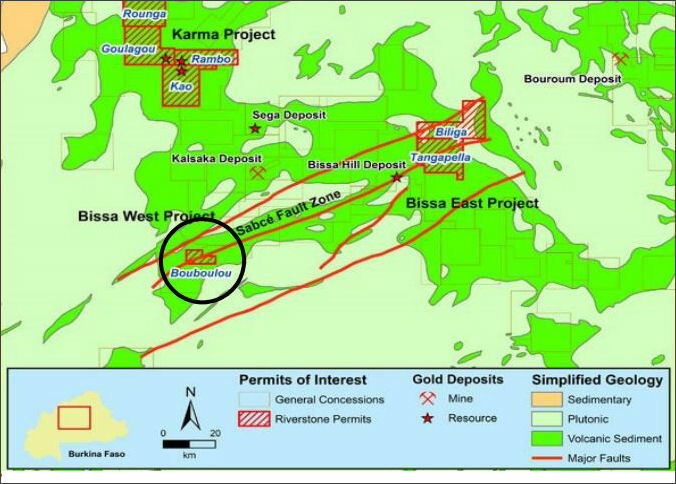 Nexus Gold also has an additional property in Burkina Faso called the Niangouela Gold Concession. This property was the second property that the company obtained but became the property of keep interest and is the property where the company is focusing it's energy and resources on at this time. Previous programs identified a zone which runs ENE and WSW occurring in the south central part of the concession. This zone has returned gold-in-soil samples up to 34 g/t Au. Rock samples have returned values up to 18 g/t Au. 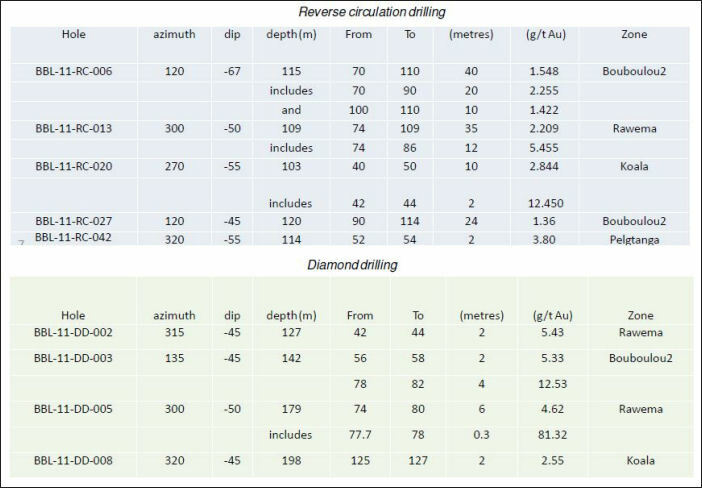 Trenching has returned values of 4.85 g/t Au over 10 meters. Prior work on the property includes 556 pits and 11 trenches, with rock and soil samples having been taken. Nexus took a total of two rock chip samples as part of the initial work program. Both came back positive. Sample NG005, taken from the primary quartz vein at 46 metres below surface in an artisanal shaft, returned a value of 2,950 g/t gold. Sample NG006 was collected from the artisanal dumps of the sheared intrusive which returned a value of 23.9 g/t gold. In January 2017 the company started a 2000 meter drilling program. The drilling successfully intersected the shear zone for over 200 metres along strike and to depths of 105 metres below surface. The shear zone remains opens along strike and to depth. Results from the phase one program delivered gold in eight of the first nine holes drilled, with several intercepts of note. They include NGL-17-DD-008, which returned 26.69 g/t gold over 4.85 metres (including 8.50 g/t gold over 0.62 metre, and 120.00 g/t gold over 1.03 metres). Hole NGL-17-DD-006 returned 4.00 g/t gold over 6.20 metres (including 20.50 g/t gold over 1.00 metre). NGL-17-DD-009 returned 2.61 g/t gold over 4.00 metres (including 5.92 g/t gold over 1.00 metre), and NGL-17-DD-003 returned 1.80 g/t gold over 5.10 metres (including 6.14 g/t gold over 1.10 metres). Today there are thousands of junior mining companies to invest in. With the recent rebound in metals and gold in particular, investor taste for these kinds of investments have turned positive. Prudent and contrairian investors know all to well that these kind of investments run in cycles. Knowing these cycles there is no doubt that the world has seen the bottom of the bear cycle and the time to look at investing in these types of investments is now. Investors who understand this will be active in evaluating companies and projects that have a lot of positives and this is a catagory that Nexus Gold is in. Here is some good reasons to have Nexus Gold on your investing radar. Location! In the heart of one of the major five trends. Past drill results showing extremely high grades. 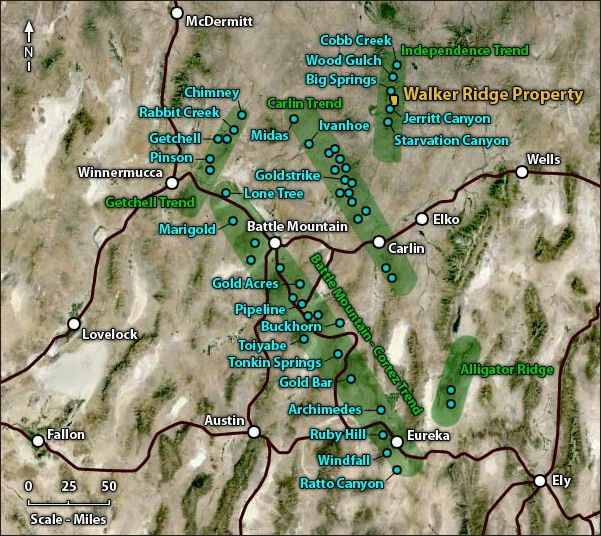 Some of the worlds largest producing gold mines in the immediate area in Nevada . Excellent option opportunities in Africa. Opportunities to aquire 100% in prime African mineral property. Has the potential to become another True Gold or Roxgold story. Excerpt from a recent government press release; The government wants to help firms that are already operating in the country to lengthen the lives of their mines and make it easier for new investors to get information about deposits, Mining Minister Alfa Omar Dissa said last week in the capital, Ouagadougou. "We've reviewed the eastern region, the west and south and found very interesting information," he said. Deposits previously unknown include "gold, lithium, nickel and a bit of uranium, even traces of oil." Nexus Gold has 63 million shares O/S at present. Way over half of the stock is held by insiders or family of insiders. The stock has a price of 4 cents low and 36 cents high within the past 52 weeks. To find out more about Nexus Gold Corp. and these projects, Click Here to visit their website. There you will find all an exstensive amount of information along with contact information.